The T-62A is a similar tank to its predecessor, the T-54, but with some differences. First, the T-54 is faster and has better hull armor compared to the T-62A. However, the T-62A has better turret armor and the turret is located a little farther forward than the T-54. The T-62A is not a front-line fighter, and is more suited to skirmishing tactics due to its weaker hull armour. This tank may not be the fastest, best armed, or armored tier X medium tank, but it has the fastest rate of fire (1 round in less than every 6 seconds), great penetration, and can even outurn the fast T-50-2. Poor gun depression greatly limits good hull down positions to make good use of the turret's strong frontal armor. 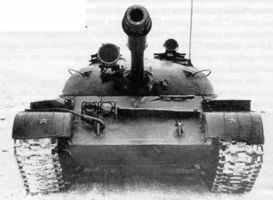 By the late 1950s, Soviet commanders realized that the T-55's 100 mm gun was incapable of penetrating the frontal armor of newer Western tanks like the Centurion and M48 Patton with standard armor-piercing shells. While 100 mm HEAT ammo could have accomplished the task, they were considerably more expensive and required more training of tank crews for proper use. It was decided to up-gun the T-55 with a 115 mm smoothbore cannon, capable of firing APFSDS rounds. Experimental trials showed that the T-55 was inherently unsuited to mount the larger new cannon, and work therefore began on a new tank. The bigger gun required a bigger turret and turret ring to absorb the higher recoil. This in turn necessitated a larger hull, as the T-55 hull was simply too small to accept the new turret. The T-62 thus took shape, marking an evolutionary improvement upon the T-55. At the time when Morozov was working on his Object 430 tank, a young engineer, Leonid N. Kartsev, was the head of the OKB-520 design bureau of Uralvagonzavod factory (UVZ) in Nizhny Tagil. He was responsible for the T-54A (Object 137G) and T-54B (Object 137G2) modernizations of T-54 main battle tank. After work on the T-54M (Object 139) modernization was abandoned he and his design team started working on a new tank, called Object 140. The new tank had a suspension with six light roadwheels made of aluminium. The turret was cast and armed with a 100 mm D-54TS tank gun with the Molniya two-plane stabilization system. The tank carried 50 rounds and was powered by a V-36 diesel engine developed by engineer Artiemejev. The engine was placed on the bottom of the hull, a solution which reduced the height of the engine compartment. The Object 140 weighed 37.6 tonnes. Morozov's Object 430 tank had a hull of welded rolled steel plates and a turret of cast and forged steel. The turret had three-layer armour with an overall thickness of 185 mm to 240 mm. It was armed with the same D-54TS tank gun as Kartsev's Object 140. In 1957 Uralvagonzavod built two Object 140 prototypes which were put on trials soon after. The trials showed that because of the complicated construction of many of the tank's systems, Kartsev's tank would be expensive in serial production and hard to maintain. Forced to abandon the Object 140 project, he started working on yet another T-54 main battle tank modernization called the T-55 (Object 155) in which he included one of the key features from his Object 140 tank: the upper fuel tanks were fitted with mounts for tank gun ammunition. This increased the ammunition load carried by the tank to 45 rounds. At the end of 1958 Kartsev decided to modernize the Object 140 turret. He fitted it with a cartridge-case ejector and mounted it onto a stretched T-55 chassis with a new suspension. He also considered that designs based on already produced vehicles had higher of chance of acceptance. The Object 140 turret diameter, bigger than the T-55 turret by 249 mm, made redesigning the central part of the hull necessary. Kartsev changed the arrangement of the torsion beams, which was necessary to keep the tank's weight balanced. The tank received the designation "Object 165" and in November 1958 three prototypes were built. While working on a new tank, Kartsev was looking for a more powerful tank gun. The 100 mm D-10T and D-54 tank guns had a fierce opponent in the form of the British L7A1 tank gun. The Soviets decided to "recaliber" the already existing 100 mm D-54TS tank gun. The modifications done to the gun included removing the rifling of the gun, reducing the profile of the bullet chamber, removing the muzzle brake, lengthening the gun tube, adding an automatic cartridge-case ejector and adding a bore evacuator in the middle of the gun tube (as opposed to the D-45TS tank gun, which had a bore evacuator in the base of the gun tube). The new 115 mm tank gun was designated U-5TS "Molot" Rapira, which was the first Soviet 115 mm smoothbore tank gun. When it went into serial production it received the designation 2A20. It was put in trials against the D-10TS tank gun, which armed the T-54B as well as some T-55 and T-55A main battle tanks. These trials showed that the subcaliber projectiles shot out of the U-5TS had a 700 km/h higher muzzle velocity. It became apparent that the maximum range of the new tank gun was almost double that of the D-10TS. The only serious drawback of the U-5TS tank gun was the fact that it was not as accurate as the D-10TS, because of the lack of rifling. However, the greater range of the gun and its extremely high muzzle velocity made the poor accuracy less of an issue. The new 115 mm U-5TS "Molot" (2A20) Rapira smoothbore tank gun was fitted into the Object 140 turret at the end of 1960. The new tank received the designation "Object 166". In 1960 both Object 165 and Object 166 prototypes passed their trials. The Uralvagonzavod was preparing to start serial production of the new tank, though the General Armoured Directorate (GBTU) was paying much more attention to Morozov's Object 430, which was in development since early 1952. Morozov was supported by general Ustinov, who was in charge of Soviet military industry at the time. He didn't see it as necessary to produce the new tank from Uralvagonzavod but soon the situation changed dramatically with the appearance of a new American main battle tank, the M60. Zaloga claimed in January 1961, an Iranian officer defected with his new US-made M60A1 main battle tank across the border into the Soviet Union but it seems very unlikely as the M60A1 didn't exist in 1961. The new American tanks were armed with a British 105 mm Royal Ordnance L7A1 tank gun, the same as the earlier British Centurion main battle tanks and the later German Leopard 1 main battle tanks. The M60's armour layout and L7A1 tank gun granted superiority to the NATO main battle tanks over Soviet contemporary main battle tanks. This situation caused great concern in the Soviet armoured forces. In 1961 the Soviet intelligence discovered that the British were working on new a main battle tank armed with a 120 mm tank gun. Because of this, General Czujkov demanded an explanation of the "Kartsev's tanks" case. At a conference of GBTU and the Soviet ground forces committee it became apparent that Morozov's Object 430 tank was only 10% better than the serial T-55. Because of this, Morozov's project was deemed a complete failure. The representatives of Kharkiv Morozov Machine Building Design Bureau said that works on a new tank, the Object 432, had already started. Czujkov demanded that production of the Object 166 main battle tank be started immediately. The OKB-520 design bureau of Uralvagonzavod provided another design, the Object 167, which was the Object 166 with a new more powerful V-26 engine using a charger, developing 700 hp (522 kW). Two prototypes were built in the middle of 1961 and passed the trials. This time the GBTU decided not to wait for the new main battle tank to pass trials and send the Object 166 into mass production on July 1961. The Object 165 also entered service in very small numbers, under the designation T-62A. The T-62 has a typical tank layout: driver's compartment at the front, fighting compartment in the centre and engine compartment in the rear. The four-man crew consists of the commander, driver, gunner and loader. Although the T-62 is very similar to the T-55 and makes use of many of the same parts, there are some differences. Those include the hull, which is a few centimetres longer and wider, the different road wheels, and differences in characteristic uneven gaps between roadwheels. Unlike the T-54 and T-55 main battle tanks, the gaps between the last three pairs of roadwheels are larger than the rest. The armament consists of the 115 mm U-5TS "Molot" (2A20) Rapira smoothbore tank gun with a two-axis "Meteor" stabilizer and 7.62 mm PKT coaxial general-purpose machine gun mounted on the right of the main gun. The 12.7 mm DShK 1938/46 antiaircraft heavy machine gun is mounted on the loader's hatch. It was optional until 1972 when all newly built tanks were fitted with the AA HMG. The tank carries 40 rounds for the main gun (although only 4 are placed in the turret while the rest are stored in the back of the fighting compartment and in the front of the hull, on the right of the driver) and 2500 rounds for the coaxial machine gun. 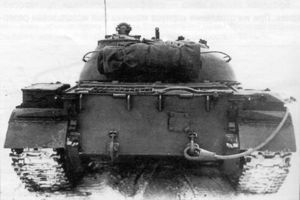 All of the vehicle's armament is mounted in or on the round cast egg-shaped turret from the Object 140 prototype main battle tank, mounted over the third pair of roadwheels. It takes more than 21 seconds for the T-62's turret to rotate through a full 360°, which is longer than the time needed by US and NATO tanks of the time. The T-62 was armed with the world's first smoothbore tank gun, giving it considerably greater muzzle velocity than the Western 90 mm and 105 mm tank guns of its time. It can fire BM-6 APFSDS-T, BK-4, BK-4M HEAT and OF-18 Frag-HE rounds. The 115 mm gun introduced the first successful APFSDS ammunition, albeit with a steel penetrator. A smoothbore gun allowed a significantly better performance (from 10% to 20%) from HEAT ammunition, which was considered the main ammunition type for fighting enemy armour at medium and long ranges. The gun can be elevated or depressed between −6° and +16°. The tank has no autoloader and has to be reloaded by hand. To reload the gun it must be elevated or depressed to +3.5°. Empty cartridges are automatically ejected outside the vehicle through a small hatch in the rear of the turret. The gun has range of fire of about 4 km during day conditions and 800 m (with the use of night vision equipment) at night. The T-62's practical rate of fire is 4 rounds per minute while the vehicle is stationary and is lower when the vehicle is moving. The low rate of fire falls behind the capabilities of Western 105 mm tank guns. When the tank and the target are stationary, the U-5TS has almost the same accuracy as the American M60 Patton and the German Leopard 1 main battle tanks. When the tank or the target are moving the accuracy becomes very poor due to the tank's poor stabilization system and the lack of a fire control system. Even the APFSDS-T rounds at a range of 700 metres are half as accurate when the target is moving with a constant speed. The T-62 uses torsion bar suspension. It has five pairs of rubber-tired roadwheels, a drive sprocket at the rear and idler at the front on each side, with no return rollers. The first and last roadwheels each have a hydraulic shock absorber. The tank is powered by the V-55 12-cylinder 4-stroke one-chamber 38.88 litre water-cooled diesel engine developing 581 hp (433 kW) at 2,000 rpm. This is the same engine as the one used in the T-55. Because the T-62 weighs more than the T-55, it is less maneuverable. Like the T-55, the T-62 has three external diesel fuel tanks on the right fender and a single auxiliary oil tank on the left fender. The tank carries 960 litres of fuel in its internal and external fuel tanks. Two optional 200-litre drum-type fuel tanks can be fitted on the rear of the vehicle for an increased operational range. The T-62 has 5% better armour on the front of the hull (102 mm at 60°) and 15% better armour on the front of the turret (242 mm) than the T-54/T-55 (although ingame version of the T-54 has thicker hull armor of 120 mm). The turret armour is 153 mm thick on the sides, 97 mm thick on the rear and 40 mm thick on the roof. The hull armour is 79 mm thick on the upper sides, 46 mm at 0° thick on the rear and 20 mm thick on the bottom. Although the armour on the front of the hull is thicker than in the T-55, the lower side armour (15 mm) and the roof armour (31 mm) are actually thinner. One of the many similarities between the T-54/T-55 and T-62 tanks is their ability to create a smokescreen by injecting vaporized diesel fuel into the exhaust system. Like the T-54 and T-55, the T-62 has an unditching beam mounted at the rear of the hull. The tank can be fitted with a thin snorkel for operational usage and a large diameter snorkel for training. The thin snorkel can be disassembled and carried in the back of the turret when not used. The commander's cupola is located on the left of the top of the turret. The loader has a single piece hatch located on the right side of the turret and further back than the commander's cupola. The loader's hatch has a periscope vision block that can be used to view ahead and behind the vehicle. The commander's copula has four periscopes, two of which are located in the hatch cover while the other two are located in the forward part of the cupola. The driver has a single piece hatch located on the left front of the vehicle, directly in front of the left side of the turret. The tank uses the same sights and vision devices as the T-55 except for the gunner, who received a new TSh-2B-41 sight which has x4 or x7 magnification. It is mounted coaxially with an optic rangefinder. 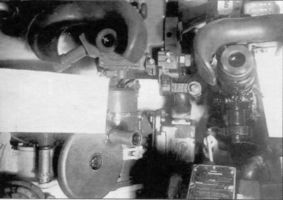 The gunner has two periscope vision blocks, one of which is used in conjunction with the main searchlight mounted coaxially on the right side of the main armament. There two other searchlights which are smaller. One of these searchlights is used by the commander and is mounted on his cupola. The tank has two headlights on the right front of the vehicle, one of which is infrared while the other one is white. There curved hand rails around the turret which allow easier entry for the commander, the gunner, and the loader. They also help the infantry to mount and dismount the tank while performing a tank desant. 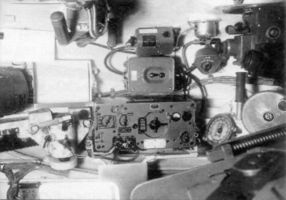 The tank has a box-shaped radiation detector/actuator mounted on the right hand side of the turret, behind the compressed air tanks. While the T-62 did not feature an automatic loader (as would become characteristic of later Russian tanks), it had a unique "ejection port" built into the back of the turret, which would open as the main gun recoiled, ejecting spent shell casings outside. This was considered advantageous since the spent casings would otherwise clutter the floor of the tank and fill the interior with noxious burnt-propellant fumes. There is a blower mounted in the rear of the turret, to the left of the spent cartridge ejection port. The T-62 shares some of the T-55's limitations: a cramped crew compartment, crude gun control equipment (on most early models), limited depression of the main gun and vulnerable fuel and ammunition storage areas. The automatic spent-cartridge ejection system can cause dangerous accumulations of carbon monoxide and possibly actual physical injury to the crew from spent cartridge cases ricocheting against the edge of a poorly aligned ejection port and rebounding into the crew compartment. Crew members often suffer blunt force injuries and burns from ejected cases bouncing around the interior of the tank. Later designs fitted a deflector behind the commander to protect him from this, but other crew members remain vulnerable. Opening the ejection port under NBC (nuclear, biological, or chemical) conditions would expose the crew to contamination. Each time the gun is fired, the tube must go into détente for cartridge ejection; the power traverse of the turret is inoperable during ejection and reloading operations. Since manual elevation and traverse are rather slow and not effective for tracking a moving target, rapid fire and second-hit capabilities are limited. The turret cannot be traversed with the driver's hatch open. Although the tank commander may override the gunner and traverse the turret, he cannot fire the main gun from his position. He is unable to override the gunner in elevation of the main gun, causing target acquisition problems. To fire the 12.7 mm antiaircraft heavy machine gun, the loader must be partially exposed, making him vulnerable to suppressive fire, and he must leave his main gun loading duties unattended. The T-62 never enjoyed the anticipated success for numerous reasons. First, the T-62 was more than twice as expensive as the T-55, and many Warsaw Pact nations passed on the new tank because they did not feel that the improvements inherent in it warranted the cost. Secondly, in 1968, a 100 mm HVAPDS tank shell capable of piercing Western armor was developed. Use of this ammo made the T-55 gun almost as effective as the T-62s, undercutting the T-62's original selling point: a bigger, more powerful gun. 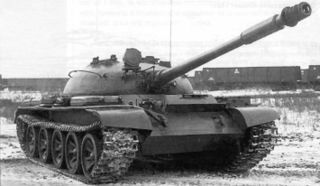 Third, the T-62 was almost immediately rendered obsolete upon its introduction by new Western tanks like the Chieftain, Leopard 1 and M60, and it became depressingly clear to the Soviets that work had to begin on an even newer main battle tank to keep pace, even though the T-62 was brand new (this even newer Soviet tank would become the T-64). Finally, the T-62 was slow and could not keep up with the new Soviet BMP (Infantry Combat Vehicle) – the principal infantry fighting vehicle which the T-62 was supposed to accompany. All of these factors combined to ensure that the T-62 enjoyed relatively low commercial success, and only briefly served in first line Soviet units before being relegated to training, to reserve status, or being exported to Third World clients. Esta página fue modificada por última vez el 25 oct 2016, a las 11:11.